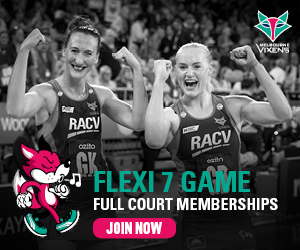 After just missing out to Collingwood Magpies at the Team Girls Cup, the Melbourne Vixens have bounced back in day one of the Bendigo Blockbuster to win a fierce contest against the Queensland Firebirds, 70-64. After a goal for goal start, some missed opportunities in the first quarter of the match left Vixens chasing a two-goal lead from the Firebirds. It was a battle of height for Mannix and Weston against Firebirds goaler, Romelda Aiken. Struggling to get over Aiken, the pair opted to put pressure on passes into the circle, limiting the number of goal opportunities. Some unfortunate turnovers at the beginning of the second quarter allowed Firebirds to obtain a six-goal lead. A change up half way through the quarter sparked intensity in the Vixens defence, Kadie- Ann Dehaney taking three powerful intercepts directly resulting in Vixens’ goals. A last-second goal by Thwaites put the Vixens back in to the game, tying the scores up at 35 all at the end of the second half. A fierce competition for control of the game, the third quarter saw the Firebirds come out strong wanting to take back a lead. A bit of push and shove in the midcourt wasn’t enough to stop Allie Smith (who was brought into the team to replace Renae Ingles), Moloney and Watson from speeding the ball down to the goals for Thwaites to sink each and every shot. Some extra bombs from the top of the circle by Philip gave Vixens the one goal advantage they needed to go into the final quarter. With the Bendigo crowd behind them, Vixens blazed into the last quarter to show why it really is a Vixens city. Newcomer to the team, Lara Dunkley, had clearly settled in with her new team, some excellent displays of forward-thinking teamwork between her and Watson across the court to help secure a deserved six-goal win. “The Firebirds came out with intent and really challenged us to begin with,” said Dunkley reflecting on the win with her new team mates. “I think what’s really good about this team is that we have flexibility and no matter who steps on everyone does their job. It really is a collective effort. An excited Dunkley felt lucky to be stepping on the court once again, and is looking forward to Day 2 at Bendigo. The Vixens will take on the Magpies tomorrow, 31 March at 1pm and will be livestreamed on the Melbourne Vixens’ Facebook page.